When a natural environment is developed, an important part of the surfaces become impervious; buildings, roads, parking and so on. This causes the previously infiltrated water now runs through the area and needed pick, transport and pour the natural environment at specific points . As a result of this soil sealing the natural water cycle is altered, producing larger volumes of runoff and higher peak flows. It also precludes rain from infiltrating the ground and recharge aquifers. 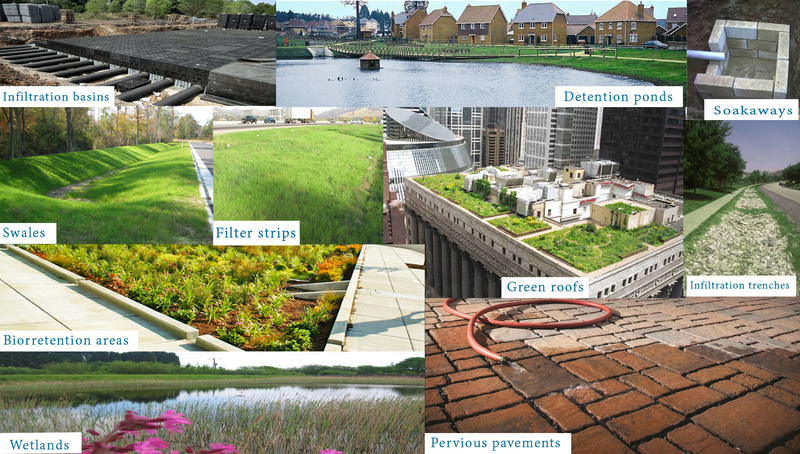 Through the implementation of Sustainable Urban Drainage Systems (SUDS ) is intended that the hydrological response of a developed area is as close as possible to where it was in its original state. These drawbacks must be added to water pollution. The rainwater washes pollutants suspended in the air (known are phenomena such as acid rain) and runs along impervious surfaces, which are often contaminated by oils and fuels vehicles, remains of industrial activities and all kinds substance. In non separative drainage networks, high flows make the wastewater treatment plant, in some rainfall events, not be able to treat all the water that reaches it and has to make a discharge directly to the environment untreated . It has always tried to collect all rainwater and through impervious surfaces such as gutters and pipes to take away as quickly as possible . Now begin to take into account not only the need to evacuate rainwater, but also the need to do so in a rational way, with lower peak flows and adequate quality. Then we would define SUDS as elements of the drainage network that will allow us to collect, transport, treat, retain , infiltrate and drain rainwater in a sustainable way.